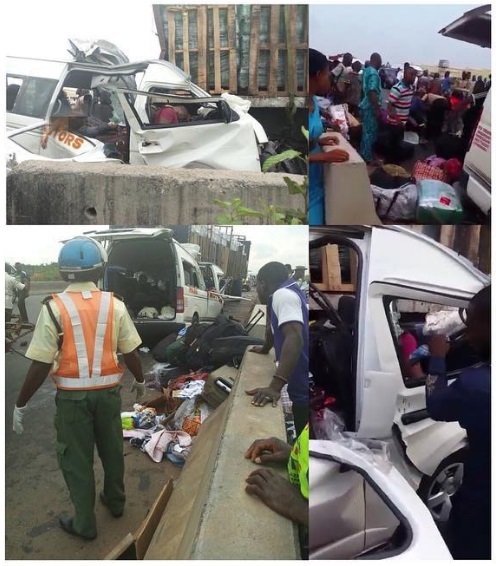 Eight persons died on Tuesday in an accident involving a white Toyota Hiace bus and a blue Mack truck opposite the Wichtech Roofing and Pipes on Lagos-Ibadan expressway. The late Edo indigenes who arrived the country from Spain this morning, had chartered the bus on the fleet of Iyare Motors and were going to Benin City for an engagement, when the accident happened. Public Relations Officer, Ogun Traffic Compliance and Enforcement Corps, Mr. Babatunde Akinbiyi, stated that the accident was caused by speeding and wrongful overtaking on the part of the bus driver. He said that seven of the passengers in the bus died on the spot, while the eighth person died at the hospital. 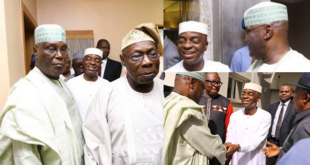 Their remains have been deposited at the morgue of the Olabisi Onabanjo University Teaching Hospital (OOUTH), Sagamu. They just didn’t know perharps they would’ve prefare to fly you knoe? It is a painful death. May all their gently soul rest In perfect peace.! What a bad recordinit? Threy just didn’t know perhaps they all could’ve prefared to fly.you know? it is a painful death though. May all their Gently soul rest in Perfect peace. What an everlasting memory init? May dere soul rest in peace..
Its quite unfortunate & so painful.If they knew,they should travelled by air.May their souls rest in perfect peace…Amen!!! u can Make over 10/24k in less than two weeks with just a least investment of #500 or above(08084926909) what’spp only for info and how to go about it,or click on the link to register directly, http://www.nairaboxfund.com.n.